While we wait to see if the astonishing McLaren P1 LM sets a new street-legal lap record at the Nurburgring, our friends at the Goodwood Festival of Speed have released spectacular footage of the car breaking the Hillclimb record for a road legal car at last year’s Supercar Shootout. Essentially a road-legal conversion of the P1 GTR, the LM comes powered by the same 3.8-liter, twin-turbo hybrid setup producing 986-hp, but thanks to some weight saving measures, is 132 pounds lighter than the track-only hypercar. Indy 500 champion Kenny Brack piloted the LM up the hill last year and will also do the business at the Ring. While we’ve previously seen footage of the run, this is the first time we’ve seen what it was like from the cockpit. 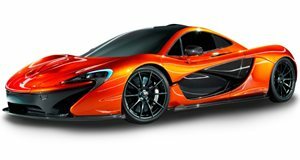 Built by British engineering and motorsports company Lanzante, only five street-legal versions of the P1 GTR will be built along with one prototype. Special features include a unique steering wheel, essentially a modified version of that used in the McLaren MP4/23 Formula One car, and some creature comforts such as air conditioning.